The molecular motor enzyme Kinesin can travel along a microtubule and transport various objects. This protein can move linearly along its designated track, against an external force, by using chemical energy provided by a high concentration of ATP (adenosine triphosphate) molecules in the environment. We derive a Smoluchowski-type Fokker–Planck equation for motion in a periodic potential and determine the stationary solution including an external force. We consider a simplified ratchet model with a sawtooth potential and discuss the force–velocity relation. For a ratchet with smooth potential we find in the low temperature limit a behavior which can be interpreted in terms of Kramers–Smoluchowski escape rates from the potential minimum over the barriers on the right and left side. 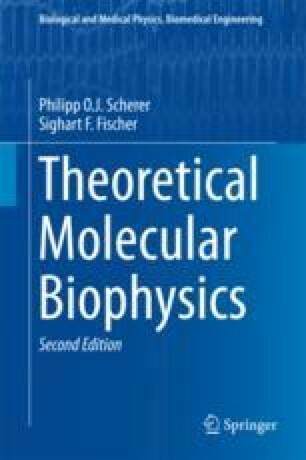 We combine the Smoluchowski equation with a simplified four-state model for the chemical reaction cycle of the kinesin molecule and end up with a system of four coupled equations, where the reaction rates depend on the concentrations of ATP, ADP (adenosine diphosphate), and P (inorganic phosphate). We discuss a further simplified two-state model in larger detail. In the fast reaction limit, the system moves in an average potential, whereas in the fast diffusion limit, the model of a Brownian ratched is recovered. Close to thermal equilibrium, nonlinear thermodynamics yields a linear velocity–force relation. The analytical treatment of the ratchet model simplifies considerably, if it is assumed that the chemical transitions take place only at certain well-defined configurations giving piecewise constant fluxes in the stationary state.